So far, you’ve been working with Zope objects in your web browser via the Zope Management Interface. This chapter details how to use common non-browser-based common to access and modify your Zope content. Editing Zope content and code in the Zope Management Interface is sometimes painful, especially when dealing with Python code, DTML, ZPT, or even just HTML. The standard TEXTAREA text manipulation widget provided by most browsers has an extremely limited feature set: no syntax highlighting, no auto-indent, no key re-bindings, no WYSIWYG HTML editing, and sometimes not even a search and replace function! In short, people want to use their own tools, or at least more feature-rich tools, to work with Zope content. It is possible under most operating systems to use the text “cut and paste” facility (Ctrl-C, Ctrl-V under Windows, for example) to move text between traditional text/HTML editors and your browser, copying data back and forth between the Zope Management interface and your other tools. This is, at best, cumbersome. Luckily, Zope provides features that may allow you to interface Zope directly with your existing tools. This chapter describes these features, as well as the caveats for working with them. Zope data is not stored in files in the filesystem. Thus, tools which only work on files will not work with Zope without providing a “bridge” between the tool and Zope’s file-like representation of its object database. This “bridge” is typically accomplished using Zope’s FTP or WebDAV features. Zope doesn’t enforce any file extension rules when creating objects. Some tools don’t deal well with objects that don’t have file extensions in their names (notably Macromedia Dreamweaver). To avoid this issue, you may name your objects with file extensions according to their type (e.g. name all of your ZPT objects with an .html file extension), or use a tool that understands extension-less “files”. However, this approach has numerous drawbacks. Creating new objects can sometimes be problematic. Because Zope doesn’t have a default object-type-to-file-extension policy, new content will often be created as the wrong “kind” of object. For example, if you upload an HTML file “foo.html” via FTP to a place where “foo.html” did not previously exist, it will be created (by default) as a DTML Document object, whereas you may want it to be created as a Zope Page Template. Zope provides a facility to specify the object type created on a per-folder and per-request basis (PUT_factory) that is detailed in this chapter. External tools don’t know about Zope object properties. If you modify an object in an external tool, it may forget its property list. Some external tools have semantics that can drive Zope crazy. For instance, some like to create backup files with an id that is invalid for Zope. Also, some tools will do a move-then-copy when saving, which creates a new Zope object that is divorced from the history of the original object. There is nowhere to send meaningful error messages. These integration features expect a finite set of errors defined by the protocol. Thus, the actual problem reported by Zope, such as a syntax error in a page template, cannot be displayed to the user. The interactions between the tools and Zope can vary widely. On the client side, different versions of software have different bugs and features. For instance, using FTP under Emacs will sometimes work by default, but sometimes it needs to be configured. Also, Microsoft has many different implementations of DAV in Windows and Office, each with changes that make life difficult. Finally, the semantics of Zope can interfere with the experience. The same file on your hard drive, when copied into www.zope.org and your local copy of Zope, will have different results. In the case of the CMF, Zope will actually alter what you saved (to add metadata). These caveats aside, you may use traditional file manipulation tools to manage most kinds of Zope objects. FTP is the File Transfer Protocol. FTP is used to transfer files from one computer to another. 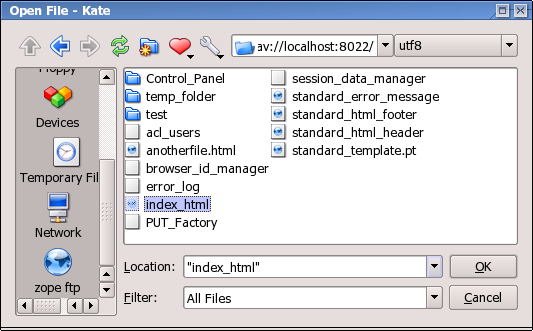 Many text editors and HTML editors support FTP. Some examples of editors and applications that support FTP are Homesite, KDE suite of applications (Kate, Quanta, Kwrite, Konqueror), Bluefish, and Dreamweaver. WebDAV is a new Internet protocol based on the Web’s underlying protocol, HTTP. DAV stands for Distributed Authoring and Versioning. Because DAV is new, it may not be supported by as many text and HTML editors as FTP. There are many popular FTP clients, and many web browsers like Netscape and Microsoft Internet Explorer come with FTP clients. Many text and HTML editors also directly support FTP. You can make use of these clients to manipulate Zope objects via FTP. The startup log says that the Zope FTP server is listening to port 8021 on the machine named peanut>. If Zope doesn’t report an “FTP server started”, it likely means that you need to turn Zope’s FTP server on by editing the necessary incantation in your INSTANCE_HOME/etc/zope.conf as detailed in the chapter entitled Installing and Starting Zope. WS_FTP is a popular FTP client for Windows that you can use to transfer documents and files between Zope and your local computer. WS_FTP can be downloaded from the Ipswitch Home Page. start WS_FTP and enter the Zope IP address or machine name and port information. Enter your management username and password for the Zope management interface. If you type in your username and password correctly, WS_FTP shows you what your Zope site looks like through FTP. 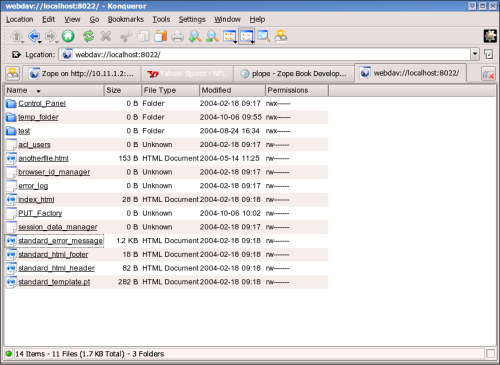 There are folders and documents that correspond exactly to what your root Zope folder looks like through the web, as shown in the figure below. Transferring files to and from Zope is straightforward when using WS_FTP. On the left-hand side of the WS_FTP window is a file selection box that represents files on your local machine. The file selection box on the right-hand side of the WS_FTP window represents objects in your Zope system. Transferring files from your computer to Zope or back again is a matter of selecting the file you want to transfer and clicking either the left arrow (download) or the right arrow (upload). You may transfer Zope objects to your local computer as files using WS_FTP. You may then edit them and upload them to Zope again when you’re finished. KDE is one of the many popular window manager for Unix. KDE comes with many applications that is FTP enabled. One such application is Konqueror. Konqueror is a file manager, and also works as a browser. Once the correct password is presented, you can now transfer files to and from your zope site. With Konqueror, you can split the Konqueror view, and make it to mimic WS_FTP, or Midnight Commander (a popular menu based file manager), as shown in the figure below. We can also edit, create or delete some known Zope objects like folder or ZPT. For instance, to edit a file-like object, right click > Open With > Choose Application > Kate. You can start editing away. Kate will do the necessary when you save your edits. click “File” > “Login as”. You can then create new Folders and transfer files between Zope and your desktop, as shown in the figure below. Emacs is a very popular text editor. Emacs comes in two major “flavors”, GNU Emacs and XEmacs. Both of these flavors of Emacs can work directly over FTP to manipulate Zope documents and other textual content. Emacs will let you treat any remote FTP system like any other local filesystem, making remote management of Zope content a fairly straightforward matter. More importantly, you need not leave Emacs in order to edit content that lives inside your Zope. To visit a remote directory in XEmacs, press Ctrl-X D and enter a directory specification in the form: /user@server#port:/ This will open a “dired” window to the / folder of the FTP server running on server and listening on port port. To visit a remote directory in Emacs, press Ctrl-X D and enter a directory specification in the form: /user@server port:/ The literal space is inserted by holding down the Control key and the Q key, and then pressing the space “C-Q”. For the typical Zope installation with XEmacs, the filename to open up an FTP session with Zope is /user@localhost#8021:/. You can visit any of these “files” (which are really Zope objects) by selecting them in the usual Emacs way: enter to select, modify the file, Ctrl-X S to save, etc. You can even create new “files” by visiting a file via “Ctrl-X Ctrl-F”. New files will be created as DTML Document objects unless you have a PUT_factory (described below) installed to specify a different kind of initial object. You need to be aware of passive mode for connecting to Zope. The “move-then-copy” problem is most apparent when using Emacs’ ange-ftp. KDE comes with many applications that is FTP aware. For example, Kate, Kwrite, Quanta, Konqueror, and many more. Browse and select the zope object you want to edit. Once selected, you can edit to your heart’s content, and click “File” > “Save” when done. Kate will save your edit to your zope server. Fill in “Zope ftp” or any other description in the description field. Enter the URL “ftp://user@server:port/” in the location field. Now, you can edit zope objects in a single click. WebDAV is an extension to the HTTP protocol that provides features that allow users to concurrently author and edit content on websites. WebDAV offers features like locking, revision control, and the tagging of objects with properties. Because WebDAV’s goals of through the web editing match some of the goals of Zope, Zope has supported the WebDAV protocol for a fairly long time. WebDAV is a newer Internet protocol compared to HTTP or FTP, so there are fewer clients that support it. There is, however, growing momentum behind the WebDAV movement and more clients are being developed rapidly. The WebDAV protocol is evolving quickly, and new features are being added all the time. You can use any WebDAV client to edit your Zope objects by simply pointing the client at your object’s URL and editing it. For most clients, however, this will cause them to try to edit the result of rendering the document, not the source>. For DTML or ZPT objects, this can be a problem. This server listens on a different port than your normal HTTP server and returns different, special source content for WebDAV requests that come in on that port. For more information about starting Zope with a WebDAV source port turned on, see the chapter entitled Installing and Starting Zope. The “standard” WebDAV source port number (according to IANA) is 9800. Unfortunately, this entire discussion of source vs. rendered requests is too esoteric for most users, who will try the regular port. Instead of breaking, it will work in very unexpected ways, leading to confusion. Until DAV clients support the standard’s provision for discovering the source URL, this distinction will have to be confronted. Zope has optional support for returning the source version of a resource on the normal HTTP port. It does this by inspecting the user agent header of the HTTP request. If the user agent matches a string you have configured into your server settings, the source is returned. This is quite useful, as there are few cases in which authoring tools such as cadaver or Dreamweaver will want the rendered version. For more information on this optional support, read the section “Environment Variables That Affect Zope At Runtime” in Installing and Starting Zope. One program that supports WebDAV is a command-line tool named cadaver . It is available for most UNIX systems (and Cygwin under Windows) from WebDAV.org. Looking up hostname... Connecting to server... connected. Listing collection `/': (reconnecting...done) succeeded. Progress: [=============================>] 100.0% of 93 bytes succeeded. In this case, the index_html object was pulled up for editing inside of the vi text editor. You can specify your editor of choice on most UNIX-like systems by changing the EDITOR environment variable. You can also use cadaver to transfer files between your local directory and remote Zope, as described above for WS_FTP. For more advanced synchronization of data, the sitecopy program can inspect your local and remote data and only transfer the changes, using FTP or DAV. KDE applications are WebDAV aware. Therefore, we can actually edit Zope objects from any of the KDE applications, such as konqueror, quanta, kate, et cetera. webdav://your.server:port/ in the konqueror location. start editing when konqueror presents the Zope workspace. Browse for your file or start editing. This chapter focused on FTP and DAV. These are the most popular and mature approaches for integration. However, other choices are available. For instance, Zope has long supported the use of HTTP PUT, originally implemented by Netscape as “Netscape Publishing”. This allows Netscape Composer, Mozilla Composer, and Amaya to edit and create new pages, along with associated elements such as images and stylesheets.